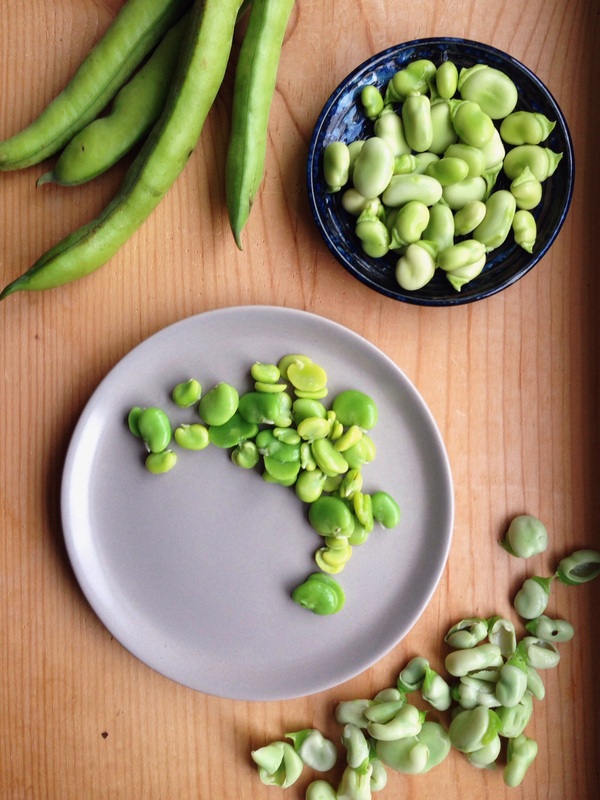 Fava beans are a great spring treat if you’re willing to put in the hard work to enjoy them. There are three parts to a Fava bean: the pod (fondly called the sleeping bag by some chefs), the husk, and the bean. You need to remove the beans from the pods and the husks in order to enjoy these sweet, meaty beans. So, here’s what you need: a pot of boiling water, a bowl of ice water, and your very own nimble fingers. First, you’ll want to unzip the sleeping bags. In other words, pull the string from the blossom end to the tip of the pod just like you would with a string bean or snap pea. Next, open up the pod and remove all the beans inside. Once you’ve removed the beans from the pod, you’ll need to blanch them in the boiling water for 30 seconds. When the time is up, pour the beans into a colander then promptly place them in the ice water to stop them from cooking. After the beans have cooled, use your fingernail to gently break open the husk, give a gentle squeeze, and out will pop the bean! Voila! Once you’ve shelled all your Fava beans, sauté them with some butter and salt. You can serve them as a side veg or gently mash them and smear them on toast with a squeeze of lemon! Enjoy!